Upcoming Interview with Kelley Armstrong Wednesday October 17, 2012. As part of Werewolf Wednesdays, this coming Wednesday October 17, 2012, I will be interviewing Kelley Armstrong, author of several werewolf novels including Bitten, and Stolen. Kelley Armstrong gave a guest lecture in one of the courses I taught at Trent University: Werewolves As Symbols of the Human Experience, and it has been amazing to get back in touch with her and talk about her experiences as a writer as well as share her insights on werewolves and the supernatural, Teen Fiction, myth-building, and character creation with readers. Kelley Armstrong: Speculative fiction helps expand the world of possibilities. Kelley Armstrong: Readers—and students—see new possibilities for new ways of thinking and living. The fact that it takes place in a fantastical world often makes it easier to consider those challenges and issues, divorced from the emotional baggage of a reader’s own world or experience. Kelley Armstrong: While I cover a lot of narrator ages in my adult series, teens are much different. There’s the dialogue of course—making the characters sound like teens. But when I’m writing adults, whether they’re 25 or 45, they’re dealing with a similar set of issues (jobs, finances, marriage & children). Teens are at a different place in their lives, and the characters need to reflect that. They also have a limited set of tools for dealing with problems. Kelley Armstrong: I’ve been fascinated by the paranormal since I was a child. I blame it on too many Saturday mornings watching Scooby-Doo. Kelley Armstrong: Where I deviate from the more common myth (like needing silver bullets to kill werewolves) I make those decisions based on what I consider most plausible. If werewolves needed silver bullets to die, what happens when they’re involved in what should be life-ending situations, like being run over by a transport truck? Kelley Armstrong: The series is called “The Otherworld.” That’s a common term for a supernatural subculture within a contemporary society. It emphasizes the otherness of the people there. They form their own culture, based on that which makes them different from others. Kelley Armstrong: In a lot of the folklore, werewolves are male. This seems to arise from the use of werewolves to explain brutal behaviour by people—they did it because they’re really part beast. Women represent a small percentage of serial killers and mass murderers (and, if they are responsible for multiple deaths, they usually use less bloody methods, like poisoning). Kelley Armstrong: While it’s fun to create a vampire rock star, it takes a fantastical being and puts him in a “fantasy” lifestyle. Readers can relate better to supernaturals who are programmers, lawyers, journalists, professors etc. I was more interested in the identity issue of hiding one’s true self rather than the issues of fitting into society when you are openly different. Check out the interview with Kelley Armstrong on Speculating Canada this Wednesday October 17th and find out about her new projects. Kelley is the author of the Women of the Otherworld series, the Darkest Powers/Darkness Rising young adult series, and the Nadia Staffordcrime series. 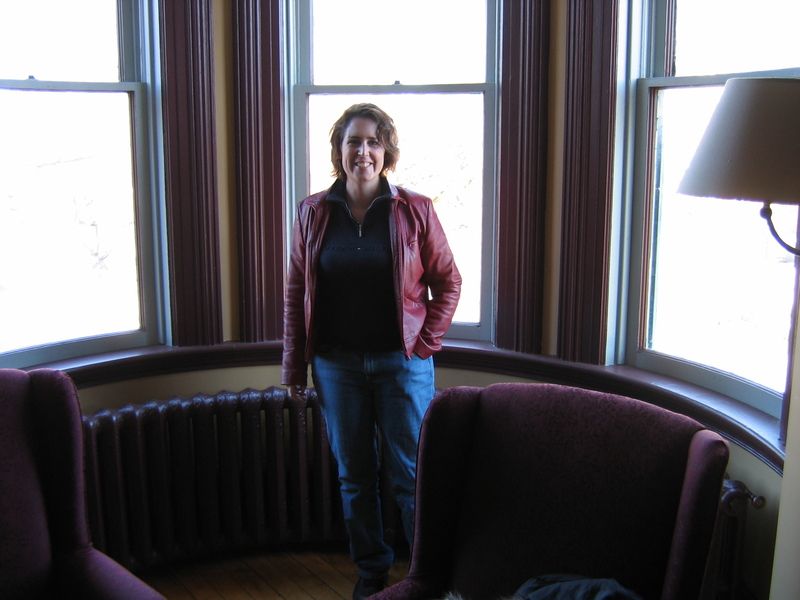 Photo of Kelley Armstrong at Sadleir House, Peterborough, Ontario. This entry was posted in Editorials, Interviews and tagged fantasy, interviews, Kelley Armstrong, news, Otherworld, teaching, Teen Fiction, vampire, Werewolf Wednesdays, werewolves, Young Adult.